These pictures were taken just yesterday. We are experiencing a delightful summer here on the west coast that, while seductive and bone warming, makes me a little anxious. Fires are common here. We need rain and the dry winds rattling the palm trees are not conducive to creating the sodden vegetation that resists arsonists sparks. My anxiety level rises with each cloudless sunrise and yet I stop to see and appreciate the beautiful place in which I live. Fires and all. Before I submerge myself into moist, war-torn England via Downton Abbey, here are some views from the “backyard” I frequent at least three times a week. It is an important part of my world, this place. 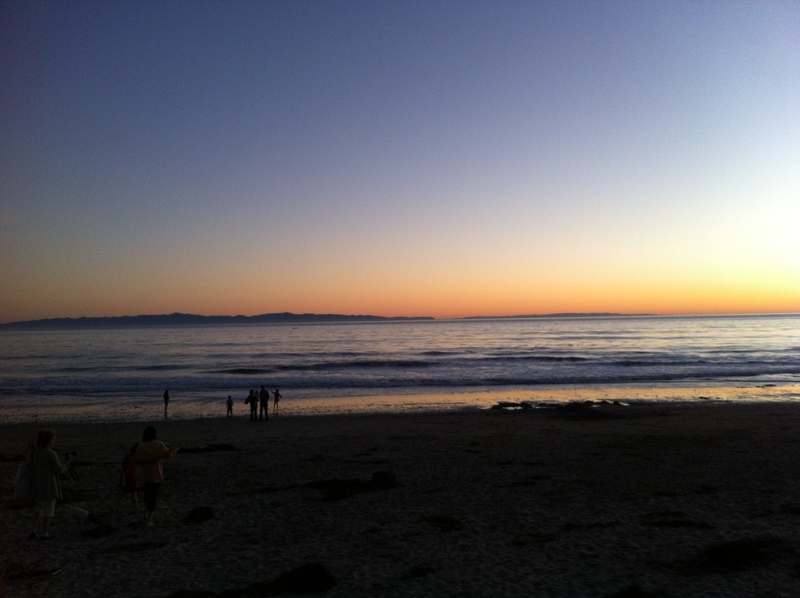 If only I had a Downton gown to wear while strolling on the beach my world(s) would be complete. Where was I? Oh yeah; LACMA, lunch, LA Artfair and then we crossed the street to Affordable Art Fair. And you know what? I don’t feel like writing about art anymore so I’ll give you the nutshell version. The LA Art Show was completely underwhelming. It consisted of redundant, soul-less art. Out of the entire Los Angeles Convention Center that housed the fair, I wrote down two names to look at in more detail. Two. That’s it. The Affordable Art Fair (affordable meaning all art $10,000 and under) was actually much more diverse, creative and interesting. Blah blah blah. That’s it for art talk. Let’s go back to food. I forgot to mention that I had dinner at a fabulously hip and incredibly delicious restaurant called LUKSHON. It’s in Culver City, in the Helms Bakery compound. It’s owned by a guy who is Jewish and was raised in Japan or by Japanese parents or wolves, or something like that. The Jewish/Japanese combination makes for items on the menu like Shanghai Matzo Ball Soup. I didn’t have it, but I will next time, because what’s not to love about spicy Matzo ball soup?? And wait! Isn’t Shanghai in China? I could have this whole story wrong. You’ll have to research it yourself. 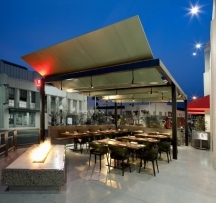 Lukshon Patio - image swiped from their website, because I didn't take any pictures for once. 1. Spicy Chicken Pops. Dear God, get these if you go. They are chicken legs from a very small chicken that are coated in spicy heaven. Get two orders. For yourself. 2. Brussel Sprouts. No, really. These aren’t your English grandma’s Brussel Sprouts. These are Jewish/Japanese/Chinese(?) small, blackened nuggets of green that taste like – well we couldn’t decide what they taste like, but boy they were epic. 3. Heirloom Black Rice. It comes with a fried egg on top and is like silky bits of rice-tasting black gold that are infused with a bouquet of yet more mystery tastes. Satisfying. We were all full and complete with just the small plates. 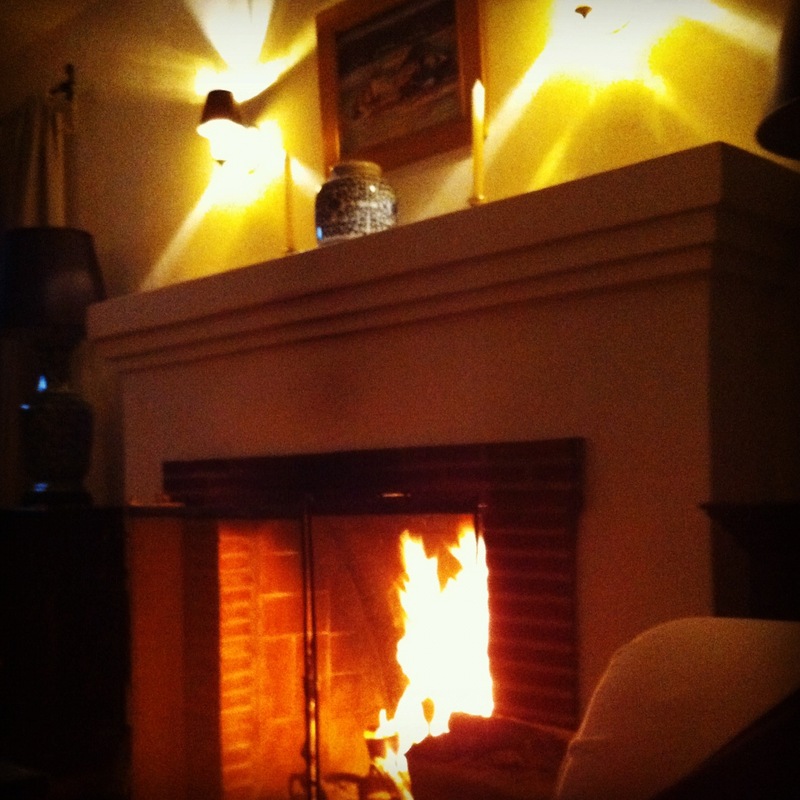 Skipping ahead, my last night in LA was spent sitting by the fire and eating pizza, YESSSSS! Pizza and I had been on an enforced separation due to over indulgence during the holiday season, but now we are back together. Or we were the other night. Seriously, this pizza was SOOOOOO good it eclipsed the recent Jewish/Japan/China food. My friend Miss M got it from a place called PITFIRE. Mama Mia it was insane! The Burrata was like soft, warm, cream, the arugula was cool and crispy, the crust was fresh baked and smokey, like you had just baked it over a camp fire (or you could call it a PITFIRE. Duh!). My only problem with this pizza was that my friend M had not MADE me have it sooner. She should know better. While eating our pizza from heaven we watched THE IDES OF MARCH which was a snooze fest, to be honest. It was only interesting when there was a possibility of Ryan Gosling maybe taking off his clothes. I KNOW! Totally not a feminist comment, but whatever. This did not happen in Ides of March. I’m sick of the corruption of our current broken political system and movies about corrupted and broken political systems and I will admit to dozing off once or twice. One noteworthy moment was the identification of Jennifer Ehle as Clooney’s unsuspecting wife. You BBC Pride and Prejudice fans will know of whom I speak. The next morning it was back on the train and home to work. It was a Sunday morning, so the train was practically empty. Again, a stress free ride up the coast, no road rage, no traffic. Views of railroad yards and scenes only visible from the vantage point of a train. 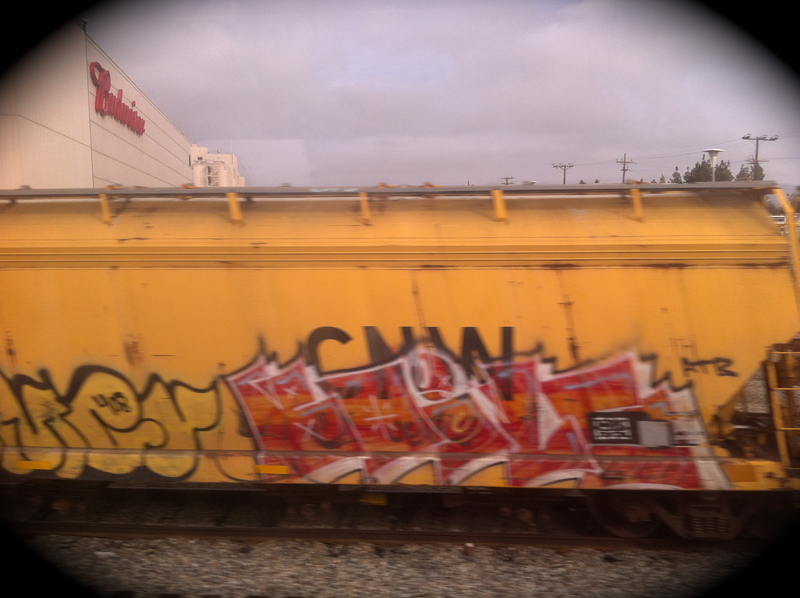 Graffitied rail cars, illegal camp sites, police cars, piles of trash, and more graffiti. At one point in Simi Valley, we passed a small town that was all facades, with worn out curtains blowing through glassless windows – obviously a studio set, but completely surreal. I didn’t have my camera ready, so we rushed past with only my mouth agape at the strange land going by. This has been, indeed, a strange post starting out about art and then rapidly going to where my passions lie – food and shirtless men. If you’ve read this far, you deserve a pizza and now you know where to get a good one. The one thing I have not written about much at all on this blog is art. More than eight hours of my every day is spent with art – choosing, hanging, selling, loving ART. It finds its way into my dreams. My work days are spent in proximity to artists ranging from canonical status to the new, clear and bright energy of those in the process of pushing their way into a wider visibility. It is a dream of a job. The job was a dream that I made reality. Anyway. This weekend was art weekend in Los Angeles. Many shows, many artists, many venues. As part of my job, I need to be out and about seeing what is new, what energy is in the gallery business, who is doing what, connecting with other dealers, artists and clients. Shaking hands, talking and talking, smiling, nodding, sharing, listening, praising, villifying, avoiding, and (if I’m lucky enough to come in contact with someone worthy) flirting. All as per usual in the daily life of a gallerina/curator. Rather than drive to Los Angeles (a drive that always leaves me with my shoulders hunched up around my ears from traffic tension after spouting the most horrific swear words your mother should never hear) I took the train. And it was fabulous. 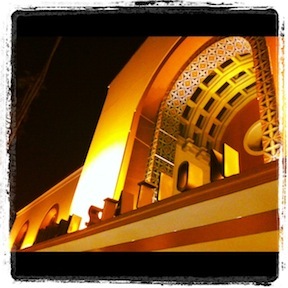 Two and a half hours of stressless bliss later I arrived relaxed at Union Station. Before I knew it I was walking slowly through the art deco hall of the lobby admiring the beamed and painted ceiling, the round discs of chandeliers, the streamlined leather chairs for weary travelers to sink into; public art in a very fine, California style. I waited for my super friend to pick me up, the lighted station sign behind me and rows of dusty iconic Cali palms in front of me, my shoulders nowhere near my ears and no need to wash my mouth out with soap. As seems to be a common occurence these days, I took a moment to notice my good fortune: to be standing outside a beautiful building, dressed warmly for the cold evening, stress-free and waiting on a friend, with the whole weekend ahead. Flash forward to Saturday morning. It’s not every day that I get picked up by one of the most handsome and gentile men ever, who happens to have the same interest in art as me and is one of my oldest friends. More good fortune. Every woman should experience being picked up by a lovely man in a black jaguar after months of post failed-relationship-rehabilitation solo ventures. It does much for boosting one’s faith in pretty much everything. 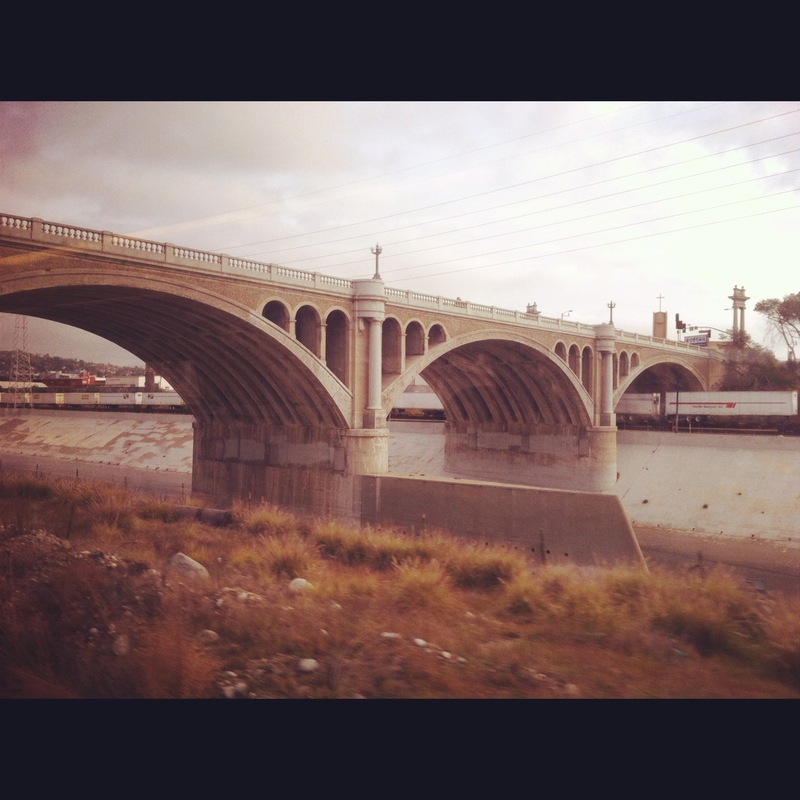 We headed to LACMA. 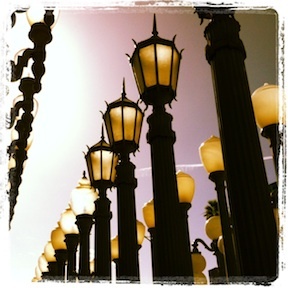 The standouts there, for me, being two works by Chris Burden: the now iconic lamp posts and the more recent Metropolis II. The lamp posts I love because they are old, refurbished reminders of childhood holidays in Pasadena, echoes of Oak Street. For a contemporary curator my heart is, ironically and iconically, stuck in the past. 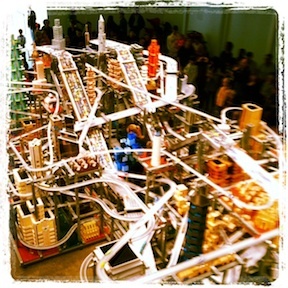 Twelve hundred custom Matchbox cars move ceaselessly through Burden’s urban creation. Metropolis II is a racing study of the the rapidity of life and all that we miss by moving so quickly through our lives, the shapes of beautiful buildings lost in the blur as we rush to the next destination guided by lines, not unlike cattle through a chute on their way to… where? The result is a hypnotic study of motion that, once sucked in, is difficult to peel away from. After the speedy metro world, we traversed the galleries to see the California Lifestyle exhibition (my personal favorites were the matching his and hers lobster printed swim costumes, but no photos because I got yelled at by a guard for taking photos of other exhibitions) and colonial art of the native Americans of Mexico and South America. I have an interest in the casta paintings of colonial Mexico, but they only had one example. Casta paintings resulted in a need to classify the mixed race unions that were an obvious result of colonialism. 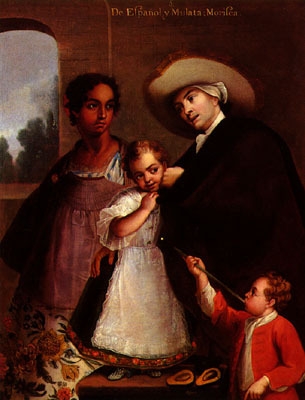 Such a painting would often depict a white man, a native Mexican woman and their new breed offspring. A good example of a Casta painting. From Wikipedia. These paintings, to me, are wonderful documents of families, of history in the making, but also the beginning of defining separation of classes and race. Okay, maybe not the beginning, but an EARLY artistic reference to race and class definition. 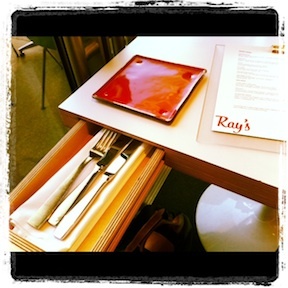 Once through all of that, we slid into hipster chairs in the LACMA located restaurant, Ray’s. My favorite part was the little drawer in the table that held the utensils. Brilliant design. The food was phenomenal (sashimi, salad, and an extra spicy Bloody Mary for me). Brought to the table was a chopping block of crusty bread and a small plate with a slab of butter covered in salt crystals and small green bits of chives. Pretty and delcious. Apropos of an art museum. After lunch we cruised through semi-empty streets downtown to the Convention Center and the LA Art Show, while listening to Etta James to honor her passing. NOTE: I am, recently, so uninspired toward any form of creativity that I am posting this post that I wrote over two weeks ago that is crap. Also, there is a lot of swearing in it. Forgive the sloppy post about to reveal itself. Whatever virus that has been felling the ranks of family and friends this holiday season is paying me a visit. Everything aches, I am hot and cold at the same time, and my brain is dull and fuzzy without a fever. 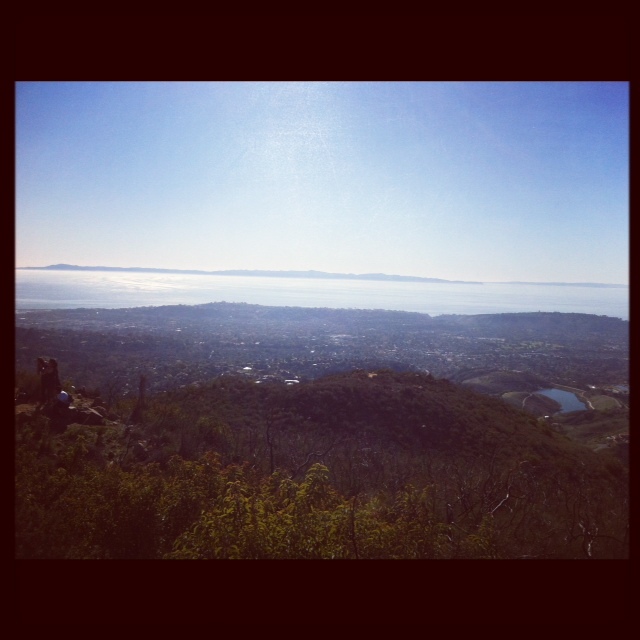 The picture below is from yesterday, my birthday, when an obliging sister let me draft her physically-fitself up a mountain trail in the overly hot sun to have a birthday view. It was completely worth it. It was probably about 70-75 degrees, but felt like 90 as we were walking. She was smart and brought water for both of us, a first aid kit, oranges, and chocolate. I brought a cup of coffee. 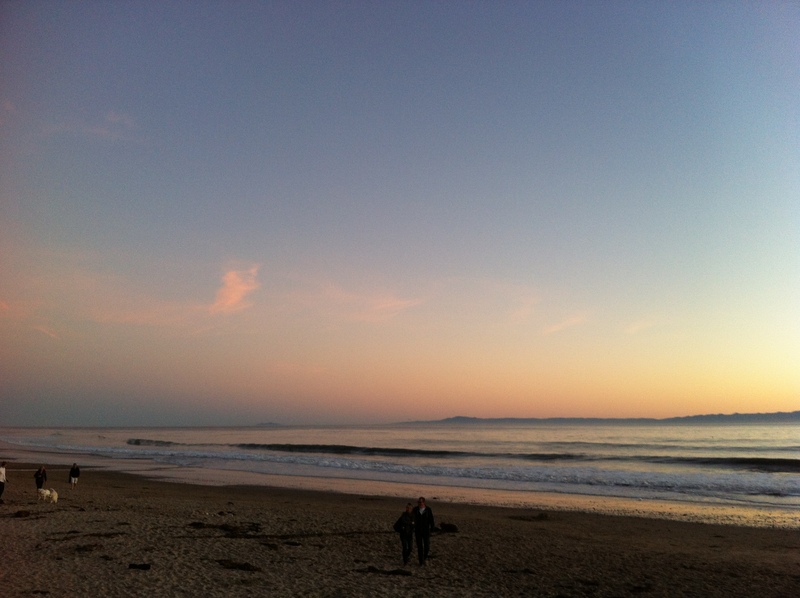 My hiking skillz are out of practice as I have been sticking to the beaches for the last couple of years. But it was good thing she was experienced or I would have expired 1/4 of the way up and then we would have had to call search and rescue followed by an embarrassing airlift to the hospital, a segment on the evening news, etc. etc. Birthday View. Not too shabby. But I didn’t and I don’t and I probably can’t. Got that? It’s impossible to see this movie and not only compare it to the book but also to the excellent Swedish version of the movie. Comparisons to the book: they changed the ending, but otherwise were true to the story. Comparisons to the Swedish movie: the Hollywood version had more money and it showed in the production quality and cinematography. Also, everyone is prettier than the Swedish actors (although, Noomi Rapace is hot). I did appreciate the fact that the harsh, wintry light accentuated everyone’s wrinkles and revealed that Robin Wright’s crow’s feet and mine are very similar (and that’s where our similarities end, sadly). That’s as in depth as I will get for this pathetic review. If you liked the book, go see the movie. It’s time for my nap.